Ooops, I can't believe another week has gone and I haven't lived up to my own resolution of posting more often! I just never seem to have long enough to sit down in the craft room and actually create. Once I've popped onto my favourite blogs (and got sidetracked of course!) I've run out of time. Maybe next week will be more productive. Hope you all have a lovely day whatever you're up to. Our granddaughter stayed over last night so I'll drop her off at her Saturday job then I'm meeting my friend for lunch ... no wonder I never have time, I never seem to be at home. You laways seem to be off out somewhere enjying life. I'm amazed that you find time to make cards - let alone blog them. Love this one. Great backgound and image. This is so adorable Anne. Love your layout. Hope you enjoyed your lunch. Hope you enjoy the rest of your weekend as well. Oh wow Anne this is just so beautiful with the black and white. Love the funky background paper, and I really like the way the image looks with how you have cut it all offset like that. This is a wonderful creation with great details and perfect for our ‘ADD REAL RIBBON’ challenge. Thanks for sharing your talent with us. Good luck. This is lovely Ann and your background paper matches perfectly. 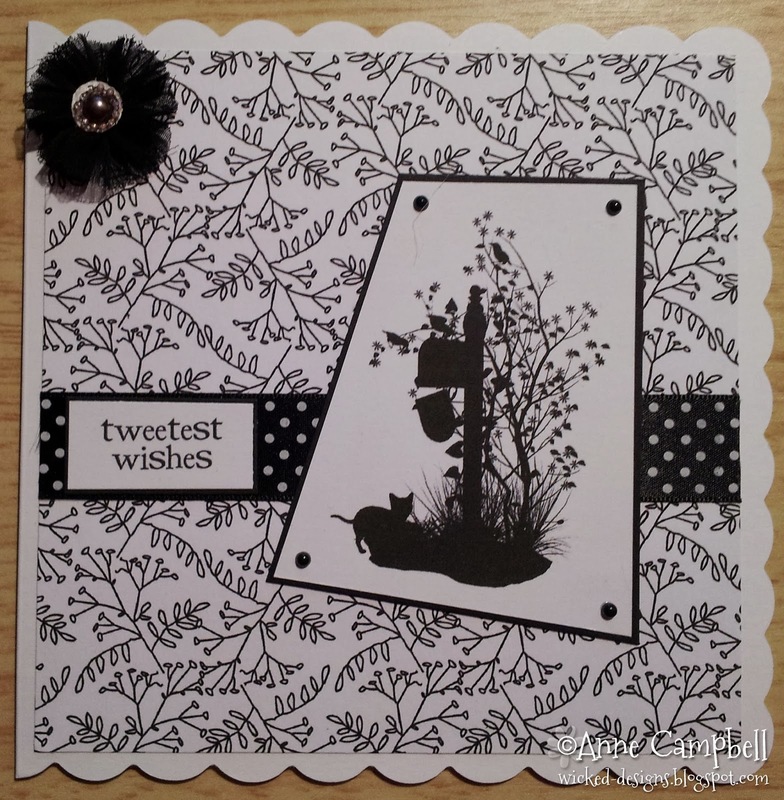 Thanks for entering my challenge at Crafty Cardmakers and More. Beautiful! Thanks for playing along with us at Party Time Tuesday! This is such a creative project. Thanks for joining us at Party Time Tuesdays! Love the black and white. A stunning card. Digistamps4Joy this week and good luck..